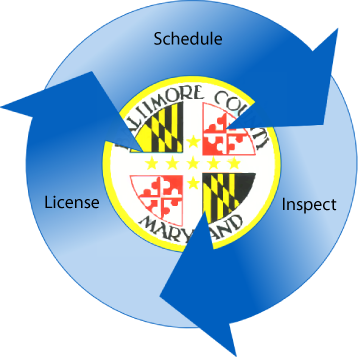 Inspection is the first step for licensing your rental property in Baltimore County. You must have your property inspected by a Maryland Licensed Home Inspector who will complete the required inspection sheet and supply a hard copy of dated photographs (when required) of the front and rear of your property. You will complete the application and other forms and submit them to Baltimore County Code Enforcement who will issue your three year license. All of the required paperwork. A hardcopy of the property photos. Allow me access to the premises. Hardwired & battery backed interconnected smoke detectors must be present and operational on every level excluding unoccupied attics, garages or crawl spaces. Wireless remote interconnection is acceptable as long as the smoke detectors are hardwired and approved by a recognised testing lab such as UL and be listed and approved for sale, installation and use in Maryland by the Office of the State Fire Marshall. To ensure interconnection works properly, units must be the same manufacturer. Smoke alarm units 10 years or older must be replaced. Electrical wires are not visible in living areas. There is hot and cold running water in kitchen and each bathroom with no leaks below sink area and all toilets flush. There are no sleeping areas in the basement or if there is a sleeping area in the basement, there is a secondary means of escape as follows: basement window with minimum 5.5 ft opening with sill height 44 inches or less from floor or basement door with thumb turn dead bolt. The furnace is either operational or because of outside temperatures it is unable to be tested. Railing is present for interior and exterior stairs with more than 3 risers. Are there any other readily observable problems that in the inspector's opinion represent an immediate threat to the health or safety of occupant?